Elia Villa in Santa Maria is a white Cycladic 5 bedroom villa with large terraces and direct access to a beautiful sandy beach. As you enter from the street there is a shaded garage for 3 cars. A path leads to a spacious interior court yard with a large built marble table, BBQ, guest WC and an open air shower. On this courtyard there is a guest room with 3 single beds suitable for teenagers and children attached to a bathroom with shower. Next to the guest house is the main entrance to the ground floor. It features open plan area including living room, office corner, TV room with library and fire place and a dining corner. Next to the living area there is a fully equipped kitchen with a separate dining area and 2 terraces. One terrace on the back and one in the front with outdoor dining facilities, side sea view and wooden pergola. In front of the living area there is a veranda with partial sea view, garden furniture and a wooden pergola. On the other side of the living area is the master bedroom with king size bed and en suite bathroom with large shower room. Wonderful sea views are possible from the bed and the veranda outside the bedroom. From the back courtyard, stairs lead us to the upper floor separate guest house. It features two bedrooms, one with Kind size bed and one twin bedded, and a bathroom with shower. 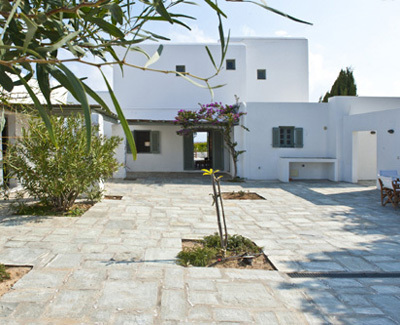 There is a private veranda with panoramic view of the Aegean and Naxos Island on the distance. A day bed with cushions is available on this veranda for your relaxation. A separate entrance leads us to the basement where one finds a bedroom with twin beds, a large storage room and a bathroom with shower. A window is responsible for the lighting and fresh air of this area. The house keeps cool temperature throughout the day and one can always find shade in one of the surrounding terraces. Fans are available in all bedrooms. The house is equipped with satellite TV, DVD and hi fi and wi fi in the living area. The fully equipped kitchen includes dishwasher and there is a washing machine in a small laundry room.